The Gulf of Mexico is the 7th largest economy in the world, and as such as provides significant contributions to industry, ecology and economy of the region. On an annual basis the Gulf of Mexico experiences an area of low oxygen or hypoxia as a result of nutrient enriched river influences increasing algal biomass and the associated bacterial respiration to decompose those bacteria. From 2004-2008 the areal extent of the hypoxic zone has been over 17,000 km2, with the 2008 measurement of 20, 721 km2 being the second largest ever documented. The 2008 Gulf Hypoxia Action Plan set a goal to reduce the size of the hypoxic zone to 5,000 km2 by 2015. To reach this goal the Action Plan calls for nutrient loading reduction targets of 45% for both nitrogen and phosphorus, based on model predictions. The Water Quality Laboratory at Mississippi State University strives to provide research, scientific outputs , public information as well as very importantly on-the ground nutrient reductions towards improving downstream aquatic ecosystem water quality, with the ultimate goal of improving ecological and economic integrity within the Gulf of Mexico. This project was funded by the EPA-GMP from 2010-2013. 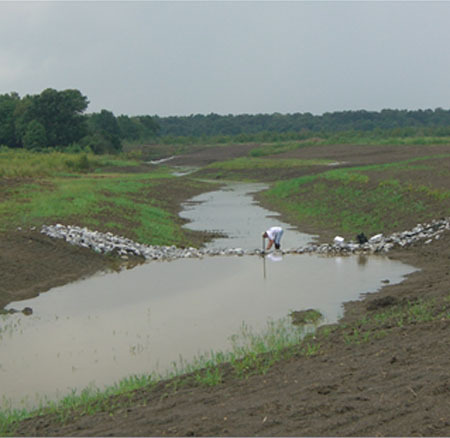 The objective of this project was to determine the efficacy of using low-grade weirs as an edge-of-field conservation practice to reduce nutrient loads in agricultural runoff from contributing to downstream water quality impairments. 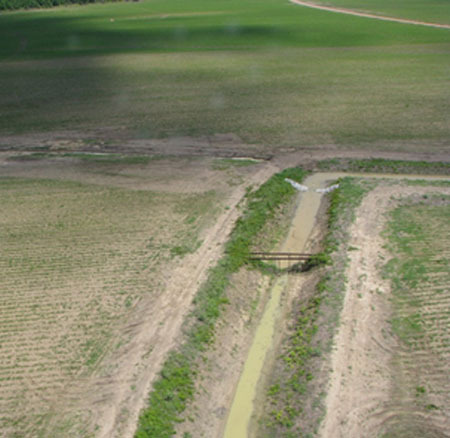 This research was conducted in the Mississippi Delta within six agricultural drainage ditches, four which had a varying number of weirs and two which were control ditches (no weirs). Nutrient and sediment loads varied, ranging from -885 to 96% and -1 to 65% reductions of total inorganic nitrogen and total inorganic phosphorus, respectively. Results of maximum nutrient reductions highlight that drainage ditches with and without weirs were able to reduce nutrients under certain conditions, while minimum nutrient reductions indicate drainage ditch nutrient removal limitations, and conditions when drainage ditches can become a source of nutrients rather than a sink. Differences in nutrient removal were also observed between storm- and low-flow samples, which ranged from 28 to 97%, respectively. 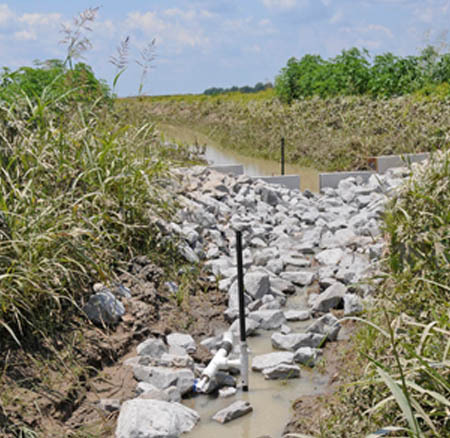 Results from this investigation highlight the benefits and limitations of utilizing low-grade weirs as an edge-of-field conservation practice for nutrient and sediment reduction, and suggest a need for tailoring drainage ditch engineering to drainage acreage and site variability. This study investigated the presence and composition of microbial communities involved in the key processes of denitrification following the implementation of low-grade weirs. Investigations of functional genes involved in denitrification via quantitative polymerase-chain reaction (qPCR) will include those encoding for subunits of nitrate reductase (nirK, nirS) and nitrous oxide (nosZ). These functional genes will also be used to determine community diversity using terminal restriction fragment length polymorphism analysis (T-RFLP). Understanding how low-grade weirs alter drainage environments in such a way that impacts microbial community structure and function, and subsequent nutrient transformations, will advance engineering and remediation strategies. Understanding the impacts of low-grade weirs on nutrient reduction capacities will also provide a greater understanding of how to improve nutrient management strategies to reduce Gulf of Mexico hypoxia. 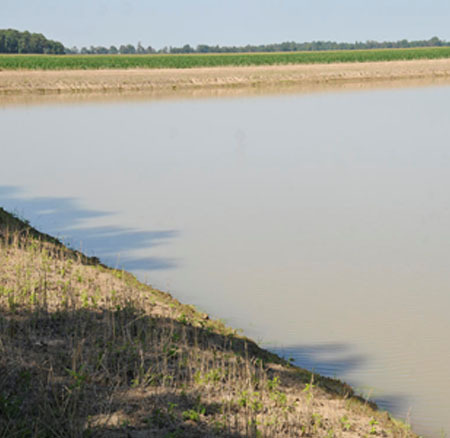 Surface water capture-and-irrigation reuse systems, also known as tailwater recovery (TWR) systems, have been utilized to address water resource concerns within Mississippi and Arkansas. The US Department of Agriculture Natural Resource Conservation Service (NRCS) has financially assisted TWR systems under Practice Code 436 in the Mississippi Delta region. 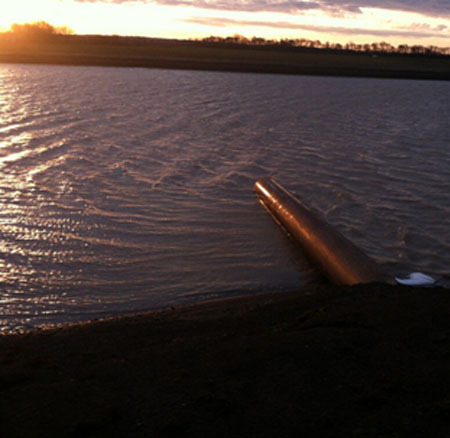 Tailwater recovery systems are designed to store surface water by combining a ditch (which captures surface water) with an optional on-farm storage (OFS) reservoir to increase capacity for surface water storage and pumps to re-lift surface water into the OFS reservoir or onto fields as irrigation. Although, TWR systems were originally designed as irrigation reservoirs to provide an alternative source of irrigation water, they have been described to have an additional benefit of reducing losses of solids and nutrients to downstream waters. Performance of TWR systems to reduce losses of solids and nutrients was evaluated by comparing concentrations and loads in water leaving agricultural fields and entering TWR systems (i.e. runoff or influent) to water overflow exiting TWR systems (effluent). TWR systems did not reduce solids and nutrient concentrations; however, loads of solids, P, and N were reduced by 43%, 32% and 44%, respectively. 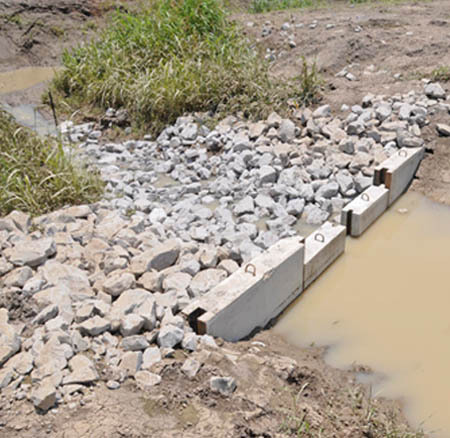 TWR systems retain runoff on the agricultural landscape, thereby reducing the amount of sediment and nutrients entering downstream waterbodies. Excessive groundwater use for agricultural irrigation has led to decreasing levels of aquifers across the US, necessitating implementation of water conservation practices. One conservation practice being implemented throughout the Lower Mississippi River Alluvial Valley (LMAV) is tailwater recovery (TWR) system which collects and stores surface water for irrigation. The objectives of this research were to design a water budget for TWR systems and quantify the total water budget for all 180 TWR systems in Mississippi’s section of the LMAV. Using these budgets, water balance for TWR systems was calculated and found to be gaining, except during months of irrigation (June to September). Extrapolating the water budget to 180 TWR systems shows a total gain of 28,714 ML annually with 15,507 ML of infiltration and 13,234 ML of irrigation which can be considered TWR systems’ contribution toward offsetting unsustainable water withdrawals of the Mississippi Alluvial Aquifer. However, total water gained from TWR systems is 15% of the annual groundwater deficit. Tailwater recovery (TWR) systems are being implemented on agricultural landscapes to reduce nutrient loss and save water on the landscape for irrigation. These systems are a large financial investment for both USDA NRCS and private producers with total costs ranging from $400,000-900,000. Although economic analyses of TWR systems have been modeled, analyses of implemented TWR systems have yet to be completed. An analysis was conducted on the costs and benefits of TWR systems. Net present values (NPV) and benefit to cost ratios (BCR) of TWR systems were used to compare the benefits to the costs. TWR systems show to maintain a positive value for producers who owned the land they farmed, however if producers rented the land the present value was negative. Beyond improvements to irrigation infrastructure, farms with a TWR system installed lost NPV of $51 to $328 per ha. The range of mean total cost to reduce solids using TWR systems was $0 to $0.77 per kg; P was $0.61 to $3,315.72 per kg; and N was $0.13 to $396.44 per kg. The range of mean total cost to retain water using TWR systems was $189.73 to $628.23 per ML, compared to a range of mean cost of groundwater of $13.99 to $36.17 per ML. Compared to other BMPs designed to reduce solids and nutrients, TWR systems are one of the least expensive ways to reduce solid losses from the landscape but remain an expensive way to reduce nutrient losses. Using TWR systems to provide an additional source of irrigation water yields a wide range in costs from less expensive than water efficiency conservation practices to similar to the high costs of practices such as desalination. Therefore, TWR systems are not considered to be economically viable when land is not owned and may be a more expensive BMP to retain nutrients and water on the agricultural landscape than other solutions. 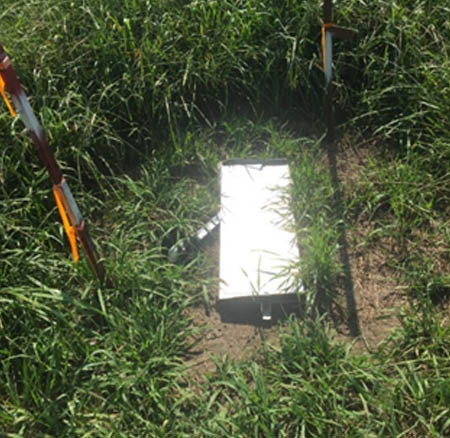 With funding providing from NRCS NWQI together with NRCS 201 and 202 monitoring and assessment programs, this edge of field (EOF) monitoring design will answer the question how cover crops on no-till ground change the concentration and load of nutrients in surface runoff. Edge of field monitoring will occur in a pre- and post-monitoring fashion, as well as in a paired watershed approach. Two sites will be monitored. 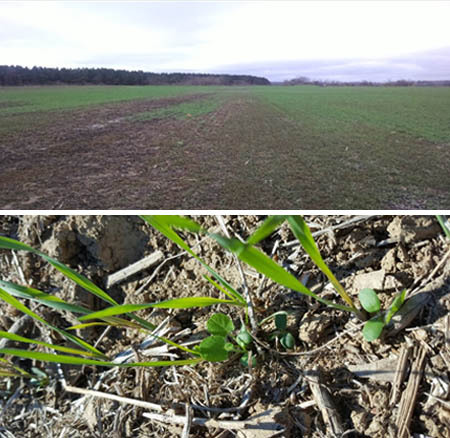 At each site there will be a control (i.e., no cover crops), compared against two treatment sites (w/ cover crops). The pollutants specifically being addressed are sediment, nitrogen and phosphorus. 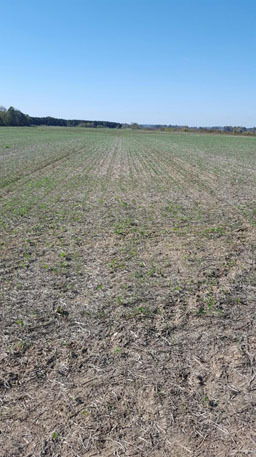 Cover crops are gaining popularity within the county, HUC and throughout the State of Mississippi. 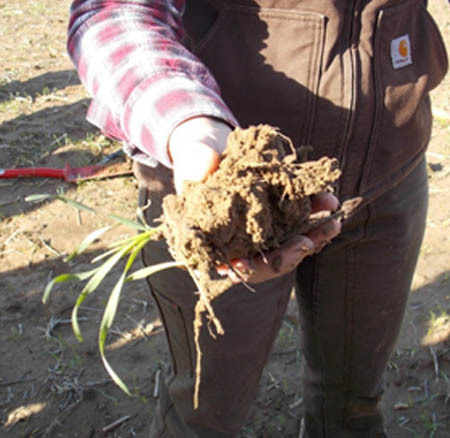 There are unknowns about the use of the cover crops, i.e., downstream impacts, tillage management after burn down, change in soil organic matter, etc. 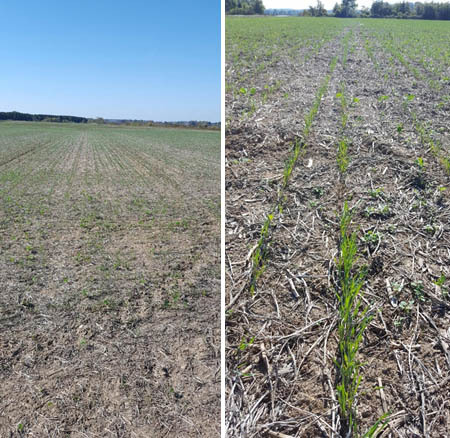 This study will provide a number of answers around cover crops that would increase it use as a conservation practice in Mississippi. The purpose of the study was to obtain insight to the impacts that feral hogs have on water quality. Following runoff producing rain events, samples were gathered from all the sampling locations. 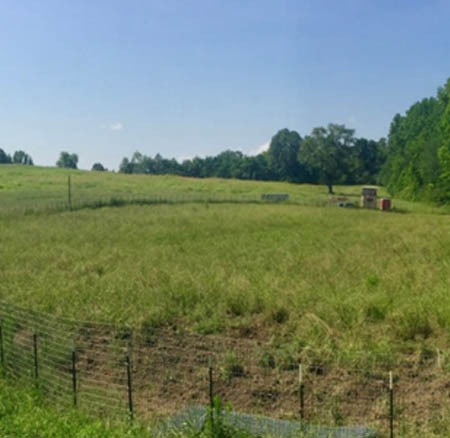 According to the data, it seems that the presence of hogs produces higher variation in nutrient concentration and bacterial abundance below the enclosure. The use of a vegetative buffer can partially displace any effects feral hogs have on water quality. 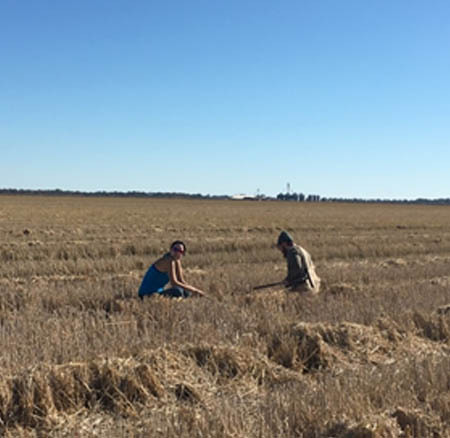 This project investigates the ecosystem services of an innovative low-external-input rice production system located in the MAV in Mississippi. The farm under study uses ecological management to provide suitable habitat for migrating water birds, which results in organic waste fertilizer deposited for use in the subsequent growing system. Characterizing and quantifying cost-benefits of ecosystem services within this model will produce solutions needed by growers in the MAV. We hypothesize that the study production system will form a reciprocal relationship between agriculture and the environment wherein essential habitat is provided for wildlife and in return the wildlife provides agronomic benefits. Based on producer testament and preliminary observations, this innovative farm uses less external fertilizer inputs, yet maintains high yields that achieves profitability. Using rain water to flood fields during winter and recapturing it for later use substantially reduces water waste. 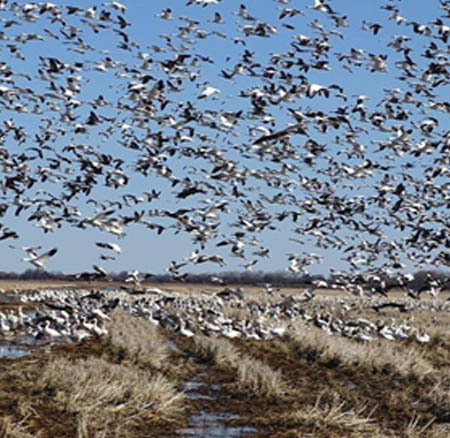 Moreover, during a preliminary survey over 30 bird species were identified occupying flooded rice fields, some flocks totaling over 2,000 individuals. This observation suggests prime water bird habitat, with abundant forage, and a critical opportunity to investigate farming practices that innovatively integrate animal and crop production. The research environment provided by the producer allows for rigorous scientific comparison of his rice fields compared to conventional rice production, with opportunity to identify key elements that can make rice a valuable sustainable crop. Joby Czarnecki, John Orlowski, Jordan Shockley, Beth Baker, in collaboration with Delta F.A.R.M. 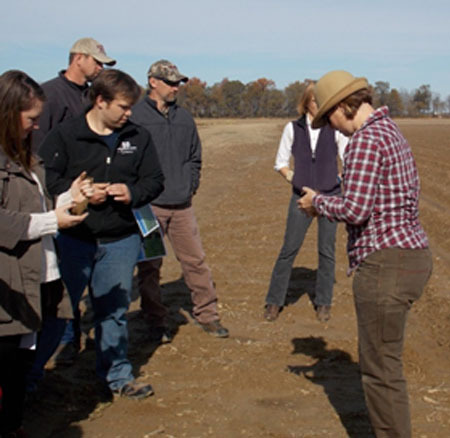 Sustainability Training in Agricultural Resources Systems (STARS), a multidisciplinary, professional development program for agricultural and natural resources (ANR) educators. The program equips professionals with relevant training and support resources on sustainable agriculture and natural resources conservation. This program will: (1) Provide instruction on natural resources conservation and sustainable agricultural practices, programs, and tools to Extension Service personnel through regional workshops and field demonstrations; (2) Tests and refines an educational model developed with input from innovative producers that can be adapted to address professional development needs of a broad spectrum of professionals; (3) Produces internet-ready materials such as instructional videos, downloadable information sheets, and educational presentations for use by agriculture and natural resources professionals, educators, and producers. Expected program outcomes include more effective response to agricultural clients’ needs for information on sustainable agriculture and natural resources practices, programs and values with the long-term goal of greater implementation of conservation practices for sustained economic viability and enhanced environmental quality. The mission of the Mississippi Department of Agriculture and Commerce is to regulate and promote agricultural-related businesses within the state and to promote Mississippi's products throughout both the state and the rest of the world.